Members of the Nigerian Senate on Wednesday descended heavily on the Nigeria Police Force for its last week Thursday’s invasion of the National Assembly. 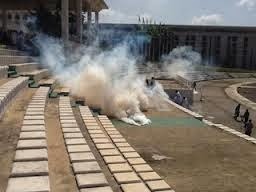 The action resulted into a pandemonium after policemen fired tear-gas canisters at the Speaker, House of Representatives, Aminu Tambuwal, and some federal lawmakers. The upper chamber, consequently set up a seven-member committee to probe the police action, within seven days, with a view to bringing to book those behind it. The Senate Leader, Victor Ndoma-Egba (Cross River Central), moved the motion while his colleagues engaged in a debate which lasted for about one hour before constituting the ad-hoc committee to investigate the incident. Members of the panel included, Senator Ahmed Makarfi (Kaduna North), who will act as chairman, while senators Abubakar Bagudu (Kebbi Central); Victor Lar, (Plateau South); Adegbenga Kaka, (Ogun East); Paulinus Igwe Nwagu, (Ebony Central); Mohammed Jibrilla Bindowo, (Adamawa Central); and Ehigie Uzamere, (Edo South), will serve as members. Mark lamented the development and insisted that the action of the police which he said remained unfortunate must be condemned by all and sundry. He said, “The Speaker (of the House of Representatives) is in touch with me and I’m in touch with the Speaker and we have put all that behind us. What we want is the strengthening of democracy in this country and whatever price we pay or whatever price we will make to strengthen democracy we will do so. 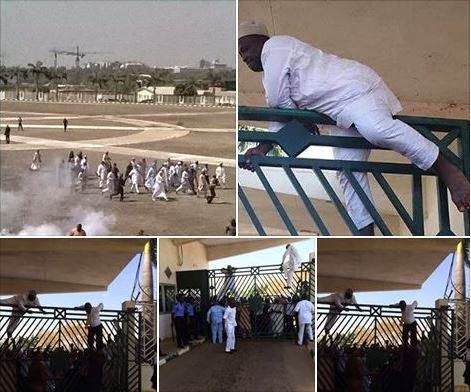 Ndoma-Egba in his lead debate, said that it was regrettable that the premises of the National Assembly was barricaded while Mark, Tambuwal, and other senators and members of the House, were prevented from gaining access into the complex. The Deputy Senate Leader, Abdul Ningi (Bauchi Central), who supported the motion, described the incident as a coup attempt by the police. Ningi asked Nigerians of good conscience to rise up and condemn the incident, saying that since the return of democracy in 1999 such a thing had never happened. He noted that since the executive and the Peoples Democratic Party had dissociated themselves from the incident, the police should be held solely responsible. The police, he said, should be reminded that the fact that they were armed did not make them to be above the law. For him, the police explanation that they were after hoodlums who allegedly planned to invade the National Assembly could not hold water since the Senate President and the Speaker could not be said to be hoodlums. The Senate Minority Leader, George Akume ( (APC Benue North West), who said the police action had clearly shown that Nigeria was gradually sliding into dictatorship, argued that the action was completely unconstitutional, regardless of whatever reasons they (police) were adducing for it. According to him, it is not the duty of the police to remove any Speaker who defects from one political party to the other but the duty of members of the Parliament. He said, “That act was unconstitutional, criminal, deliberate and intended to tell us that we are not what we are or what we called ourselves.Where are the privileges of the National Assembly?